Thanks so much for stopping by! I wanted to take this opportunity to give all of you an update about Schoolgirl Style and explain how things have changed a bit from last year. At the end, I have a special announcement that I can’t wait to share! As you might have noticed, I’m no longer carrying any of the borders, pom poms, daisies, lanterns, tassels, and classroom accessories. I know that this has really disappointed some of you. I’ve received email after email from customers asking what happened. I know that all of you are probably wondering the same thing. Nope, I didn’t go out of business, but there’s definitely more to this story and I wanted to share, so there isn’t any speculation or guessing. Basically, the Schoolgirl Style Shop was a HUGE responsibility and a major undertaking. Having this type of business required hiring and managing employees, buying and fulfilling large quantities of inventory, filling orders and shipping them all over the country, and SO much more. I learned that in order for my business to be successful – I need to be there overseeing the daily operation. Since I teach Kindergarten, making sure I was at the shop became increasingly difficult. After teaching a full day, the last thing I wanted to do was ship boxes. After school, I would often head to the shop and work for about four hours. Most of the time I brought my kids with me, and my husband would come and pick them up when he finished working. I also spent weekends at the shop while my husband took over the responsibilities at home. It was a tough situation for our family and I was miserable. I felt guilty all the time and knew I was burning the candle at both ends. My health was suffering and I was constantly tired. I knew something had to change. No one wants to live a life that they can’t enjoy because they work too much. I know that some of you are probably thinking, QUIT TEACHING! Even if I made the decision to quit, owning your own business is not a 9-5 job. If you want something to be successful, you need to put the hours and the sweat equity into it. I’ve learned that having a business requires a lot of work and sacrifice. During my period of soul searching, I happened to get an email from someone at Oriental Trading asking if I would be interested in working with their company. After going back and forth with them through email, I flew to Omaha, Nebraska, to meet everyone and to stage their classroom decor collections that were coming out for the upcoming Back-to-School season. What I didn’t know about Oriental Trading (that I learned later while talking to them), was that they had an awesome education section they were building on their website. When they told me that I could choose anything from the catalog to help me style the rooms, I was shocked at everything they carried! I had no idea they had classroom pillows, rugs, storage solutions, classroom furniture, accessories, and so much more! I was truly amazed at everything they had to offer! After I came home from Oriental Trading, I began my Back-to-School season. I was busier than ever! The entire summer was an absolute whirlwind…between working at the shop, answering emails all evening long, and spending the rest of my free time designing and decorating for the upcoming season, I was ready to collapse at the end. I had never been more tired and more worn out than ever before. When school started in the Fall, I actually felt like I could rest. My lease was up at the shop on September 18th and I knew it was time to make my decision. After meeting the people behind Oriental Trading, I knew that my customers would have a great place to buy everything they needed for their classrooms. I wouldn’t leave any of you high and dry. I know as the education side of Oriental Trading grows, they will end up exceeding your expectations in this department. Deep down, I knew all along what I needed to do. Schoolgirl Style was originally created out of my passion for design and decorating. Those two things made me happy. Shipping boxes wasn’t what I wanted to do. I began to focus on simplifying my life, finding the things that brought me joy, and eliminating the things that caused chaos and conflict in my life. Feeling confident about my decision, I knew it was time to let the shop go. Needing to be out by September 18th, meant that I would need to take all my inventory home with me OR I could give it away. Well, I wasn’t about to complicate my life any more than it was by bringing home a couple moving trucks full of classroom decor, so I made the decision to give it ALL away. My friends thought I was crazy. In all honesty, I probably was a little bit. I was so desperate to simplify my life that I didn’t care. I knew that I could help hundreds of teachers, hundreds of schools, and hundreds of children. This is why I started Schoolgirl Style in the beginning…I wanted to help others. This was the ultimate way I could give back to the profession that I love and admire most. Teachers were frantically grabbing everything they could get their hands on! I understood the desperation they felt and how every bit of it would take the financial burden off so many. I saw many tears that day and got lots of hugs. It was probably one of the best feelings I’ve ever had in my life. One teacher even sent me little thank you cards from her students and wrote me the sweetest letter explaining that everything she received that day changed her life. I was able to walk out of an empty shop that day with a full heart! That day was also the beginning of my new life. I no longer had that burden hanging over me. I could now go home after school and just relax and spend time with my family. My weekends were no longer spent shipping boxes. I instantly felt renewed, refreshed, and so relieved. After I shut those doors, I needed a break from it all. I enjoyed my life for several months after that. I didn’t decorate. I didn’t blog. I didn’t design or style any rooms. I very rarely posted on social media. In order to be more present in my daily life, I made my family and my classroom my priority. It felt really good to just stop for a bit and just BE. I’ve had a lot of time to reflect and to make decisions about my next move and how I want to proceed with Schoolgirl Style. I can feel change in the air, but not really sure what that “change” is yet. I am always open to new opportunities. I have a million, crazy ideas floating around in my head. I haven’t nailed down an exact plan yet, but I am so excited about the future of Schoolgirl Style. I’ve recently hired my work BFF, Ashley, to help load the shop with new products, write product descriptions, and help answer emails this summer. Ashley is an awesome First Grade teacher- she’s super organized, talented, has amazing ideas, and she’s such a hard worker. It will be nice to have someone on board that knows education and uses my products. I’m hoping that hiring Ashley will give me some time this summer to do things that I love, including the announcement down below!!! :) Welcome to Schoolgirl Style, Ashley!!! -I will be creating my new classroom decor collections for the following year. I do have some ideas and plans underway. Believe me, the wheels are turning right now! – I plan to head back to Oriental Trading headquarters this summer with the other education bloggers for our Blogger Workshop. April McNair (from a Modern Teacher) and I have been in cahoots on this project for quite some time now and we are so excited we finally get to share!!! We’ve done many projects together over the years and I think this one is the best one yet. This is going to be SO MUCH FUN! As teachers for over 17 years, we know this is not your average teacher workshop. It’s time for you to get creative and do some hands-on projects that you will actually have the time to complete AND take back to your classrooms. My heart is just bursting with excitement to share all the details. Here they are!! Teachers CREATE® is a hands-on 3.5 hours of creative ideas and DIY projects you can take back and use in your classroom. No need to bring any materials. All will be supplied. A light lunch will be provided for the first session and a light dinner will be provided for the second session. Airfare or other travel expenses are not included. Due to the cost of the materials, no refunds will be given for cancellations. If you are unable to attend and have a friend that would like to go in your place, contact us directly to switch the names. No professional development is given. Come join us for a workshop of FUN! Plus, we’ll have door prizes and swag bags!!!! You don’t wanna miss this! Due to the nature of the event, space is *extremely* limited so purchase your ticket today!! Tickets go on sale THIS FRIDAY, May 5th at 7:00 am central. You can buy tickets right here on the blog. There will be a link to the event page on my sidebar this week! I really hope you get a chance to make it!!! Thank you for sharing all of this with us. We are excited for what’s in store for you in the future. 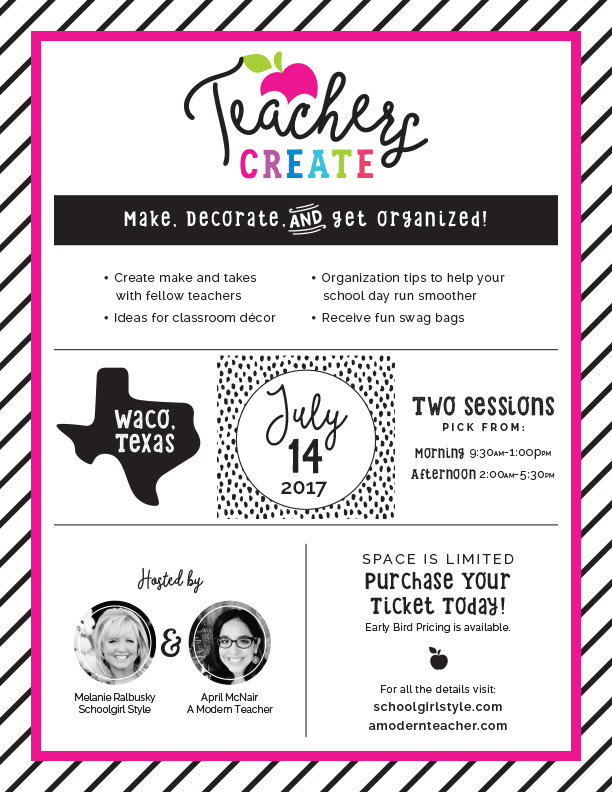 The WACO workshop looks like SO much fun! You are brilliant, but family comes first. You never know what the future holds. Best of luck to you! That is super exciting news for you and School Girl Style. As much as I love seeing your classrooms and designs, I know how important family life is. I’m glad you have had time to recuperate, breath, and enjoy your family. Excited to see what is in store for you next! Thank you for being so honest and vulnerable about the entire situation. I understand to well that the balance of teaching and family is a constant battle. I\’m glad you are enjoying your time with your family more. It\’s the reason we work so hard. In the end, your creative work still is the best out there. I am excited about decorating with your new styles. Maybe you can link to some of the other websites that have color coordinating products to enhance our classrooms. As for the workshop, I am so sad!!!! I will be in San Antonio for a AVID summer institute. I would have loved to meet you and April ( I buy her planners), shop at Magnolia (again) and make some wonderful stuff. I hope it\’s wildly successful so you can offer another one that I can attend! Blessings and prayers. The Waco sessions sound amazing! I’m a 4th grade teacher, will it be geared more for the younger kids? Hello, Can I get the link to purchase a ticket for this event. I promise I looked and looked (asked 3 before you…lol) about it. Thanks! You are so talented and creative and I would very much like to meet you. My dream classroom would be one you designed for me!! !